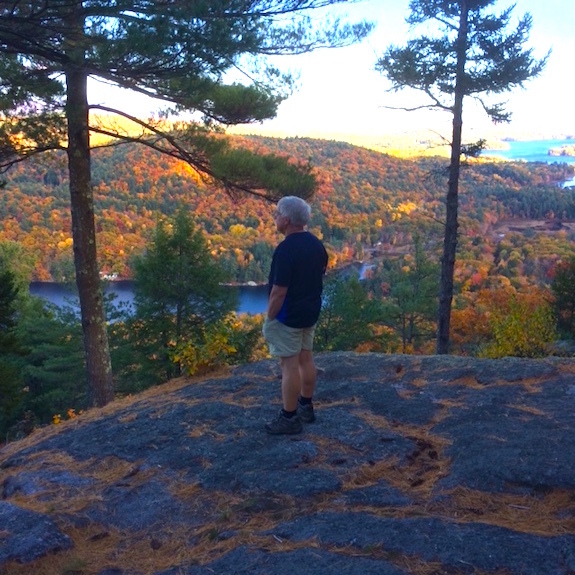 On Wednesday, October 19, 2016 I hiked with Jim Cluett, W1PID and Dave Benson, K1SWL up to the Bald Ledge scenic vista. 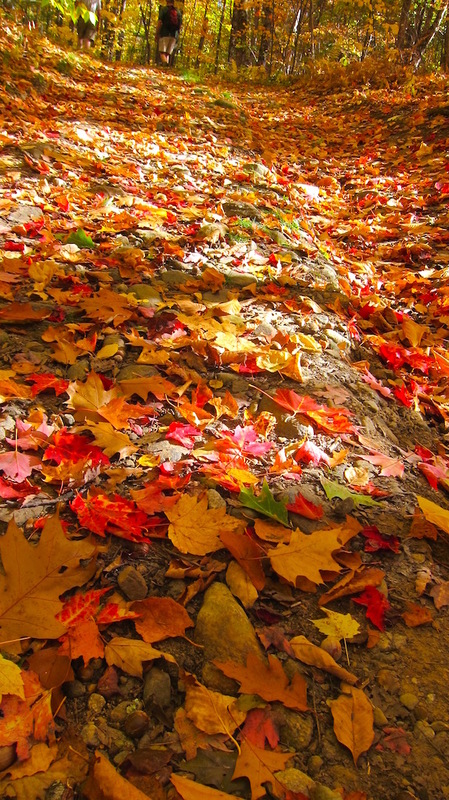 We were blessed with a bright sunny day with temperatures pressing up against 70 F. In the sun it felt more like 80 F.
The fall color was at its peak and it was mesmerizing to be walking through the woods to experience Mother Nature’s handiwork. Jim and Dave were going to try to see how many QSOs they could extract from the ether during the CWT sprint. This is a fast-speed contest and there’s no way my CW, or Morse code, skills are at that level to compete. I was just there because I love the outdoors, Bald Ledge is one of my favorite hikes and the view this day would be stunning. 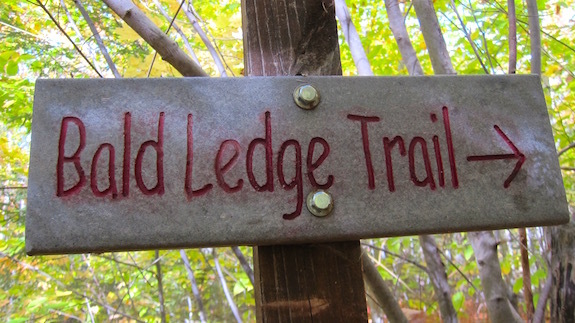 Bald Ledge was created by the last period of continental glaciation here in North America. The enormous glacier, thousands of feet thick, slowly crept over the landscape grinding and tearing at solid bedrock. It did this over thousands of years starting at the North Pole on its way to New Hampshire eventually covering all of New England and much of the upper Midwest of the USA. 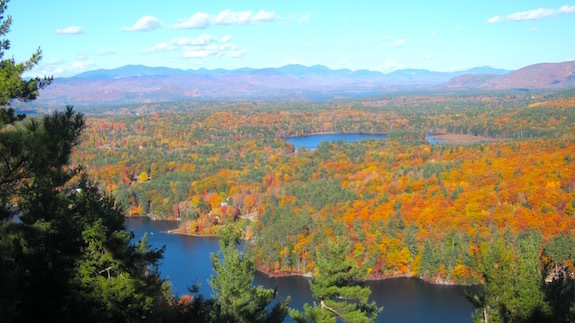 It’s direction of travel was from the northwest here in our part of New Hampshire and as it passed over mountains it created a gentle slope facing northwest but plucked rock from the southeast-facing slopes of all the terrain around much of eastern New England. 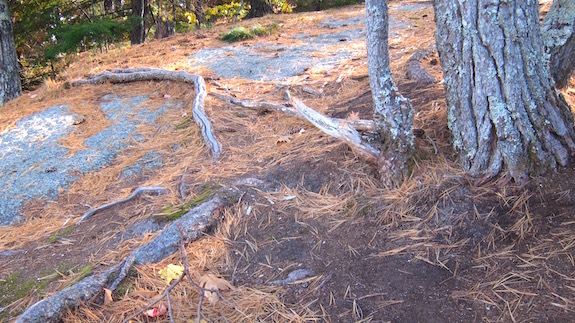 This plucking action created steep rock faces just like Bald Ledge. You can clearly see this in a topographic map. Here’s just a small section of a topographic map of New Hampshire. The red arrow points to Bald Ledge. (C) Copyright 2016 Google Maps Google Inc. 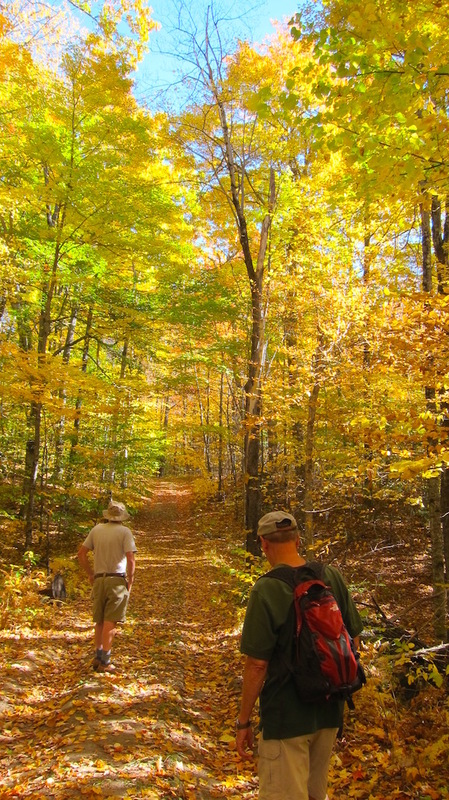 This was to be a simple hiking trip for me to soak up all the splendor as autumn is my favorite season. You’ll see why as you peer at the following photos. 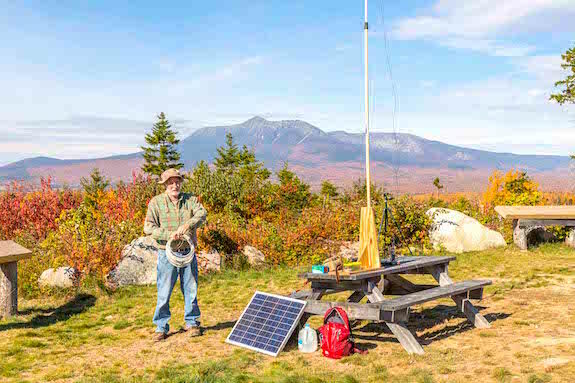 To activate Katahdin Woods and Waters National Monument as part of the American Radio Relay League’s (ARRL) 2016 National Parks on the Air (NPOTA) event, you have to want it bad. More so than the chasers that want you in their logbooks so they can claw their way up and over other operators trying to get to the top of the NPOTA leader board. Because this new National Parks property is so remote, you don’t want to invest all the time and effort to get here only to create disappointment for yourself and the NPOTA chasers. But it can happen, and it almost happened to me because of my newfound outdoor radio bravado. Consider this. 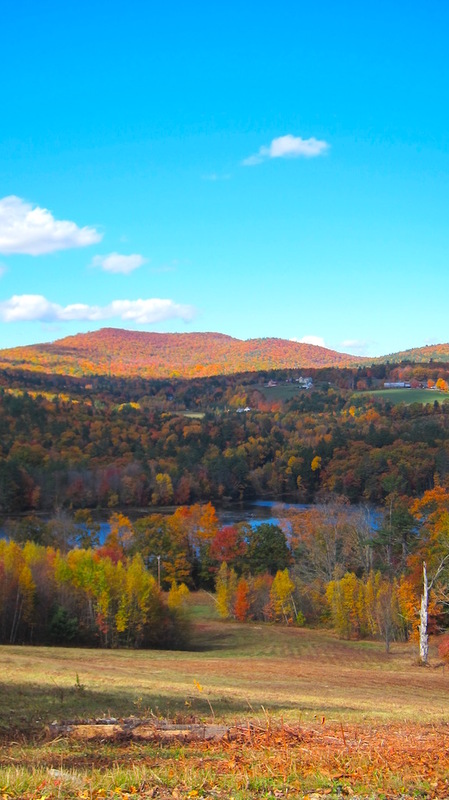 After crossing the New Hampshire / Maine border and then driving northeast for just under three hours, you’ll only find yourself just north of Bangor, Maine on I-95. Once you streak by the last Bangor exit, off ramps become scarcer than QSOs during solar doldrums. Those few exits you see usually have no gas stations or restaurants. You still have another hour of driving before you can get off the interstate highway to make your way to Katahdin Woods and Waters. When you see the exit sign for Millinocket, it’s time to get off I-95. 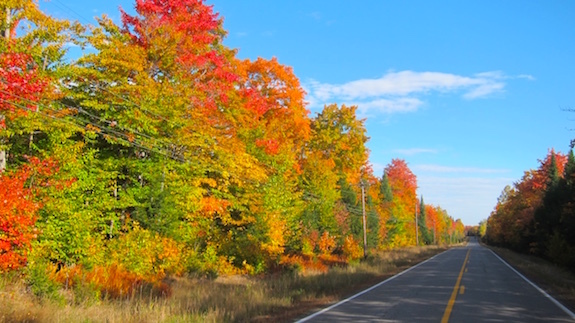 To get to Katahdin Woods and Waters, you have to travel west and then head north on Maine Route 11 from East Millinocket, Maine. Set your trip odometer as you make the turn onto Route 11 because by the time you get back to this tiny outpost of limited civilization after touring Kathadin Woods and Waters National Monument there’s a good chance you’ll have traveled no less than 120 miles. I say this assuming you don’t get lost on the unmarked logging roads you’re about to traverse. Fill your tank with gasoline, bring food, water, toilet paper and have a Maine Road Atlas close at hand. A GPS unit that creates a route memory allowing you to find your way back is not a bad idea if you’re map-reading challenged. You’re headed into the wilderness and don’t count on getting any help from anyone should something go wrong. 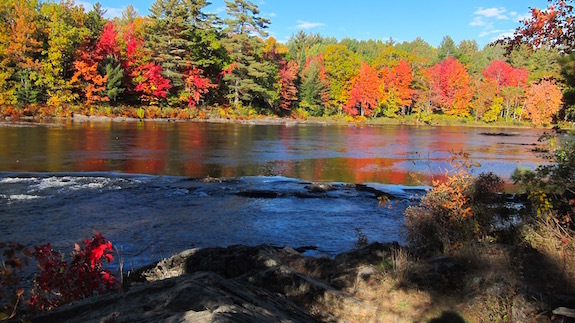 As you drive north towards this new National Park asset, you’re hugging the shoreline of the east branch of the Penobscot River. Every now and then you’re treated to a stunning view of a quintessential New England river replete with giant boulders, fast water and shorelines lined with evergreen and hardwood trees that seem to scratch the sky. 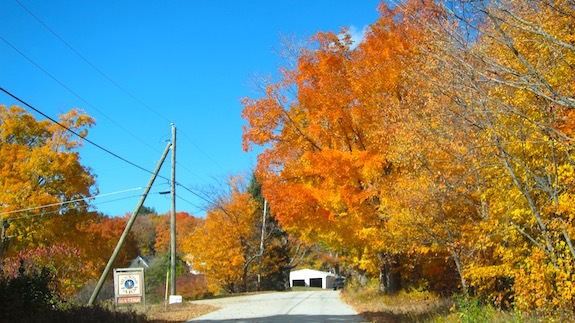 After traveling north on Route 11 for about twenty miles, you’ll arrive in Staceyville, Maine. There are no signs. There’s no business district. There’s but one house on your left where Route 11 takes an abrupt right turn pointing you towards Sherman, Maine and I-95. Turn left at this house and as you leave the blacktop, you’re on Swift Brook Road. Forget about looking for a road sign. You know you’re headed in the right direction because across the hay field to your left you’ll see it – the majestic jagged peak of Mt. Katahdin slicing into the sky. 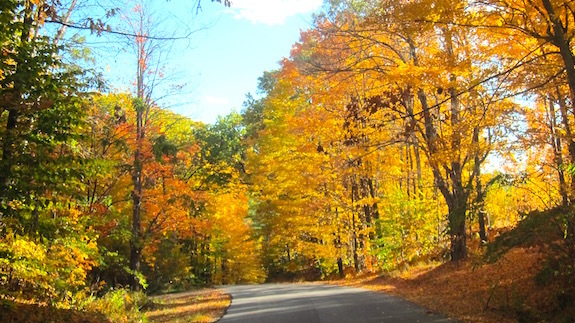 It’s time to drive west along this bone-and-strut-jarring gravel logging road for 16 miles before you get to the 15-mile dusty gravel circular Katahdin Woods and Waters Loop Road. Signage is poor to non-existent on these logging roads. When you see orange ribbons of surveyor’s tape hanging from bushes or brush, be sure to slow down. These warn you about potholes or depressions deeper than the Mariana Trench. Rumor has it the locals steal or destroy the signs because many didn’t want this new national monument in their backyard. Several intersecting roads tempt you to turn onto them. Should you make that mistake, it’s quite possible all anyone will find in the future will be your bones and a pile of rust that once was your car or truck and your radio gear. You’re deep in the wilderness, trust me. 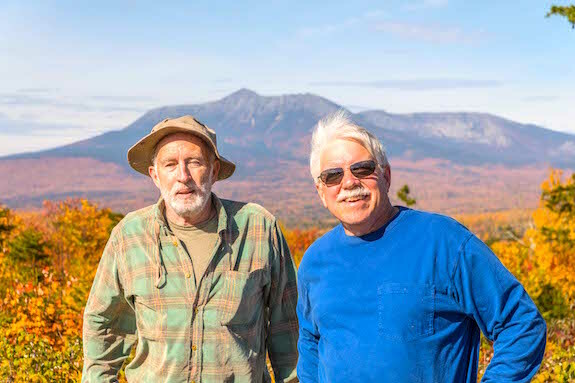 I was making my journey with Dave Benson, K1SWL and we had the good fortune to arrive in this remote part of Maine when fall color was at its peak. We both successfully activated this National Park unit on October 8, 2016. I only got twelve QSOs, just two over the minimum required for an official activation. Dave scored thirty-seven contacts. Eleven of my twelve QSOs happened only because Dave was there. 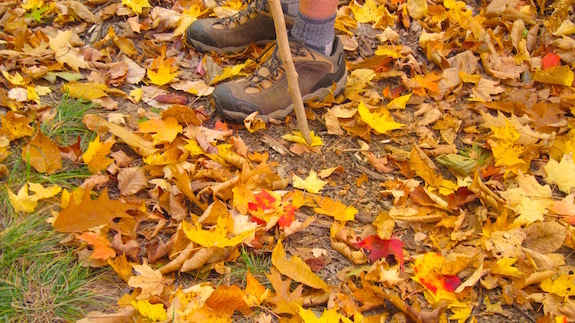 But before I tell you about what happened to Dave and I on this magical autumn day deep in the wilds of the great state of Maine, there’s something you need to know. This day turned into a humbling experience for me and a teaching one for you if you’re thinking of wandering into the woods to witness the magic of outdoor radio. My previous eight months of successful NPOTA activations had overfilled my confidence tank to the point I thought I was invincible. My amateur radio experience is as thin as a business card. I was first licensed in 2003 and just dabbled in 2-meter work for a year. Lacking a mentor, I dropped out of the hobby until 2011 when I did a public service event on the flanks of Mt. Washington in New Hampshire. A year later I obtained my General privileges and started to try to learn CW with the help and patience of Jim Cluett, W1PID. My progress was very slow because I wasn’t putting in the required time to become proficient. I really didn’t start to do HF radio until the fall of 2013 and then only sporadically. In other words, I’m still quite wet behind the ears and know enough about power, antennas, radios and all things HF to be highly dangerous around myself. My first NPOTA activation happened on a brisk day in February, 2016 at Saint Gaudens National Historic Site. I was just an observer watching how to work your way through a pileup. I had never heard one before and was stunned by what happened. Jim and Dave Benson, K1SWL were there on that winter day and worked together to garner almost 90 Morse code, or CW, contacts in just over one hour. I drove home thinking I’d never ever be able to handle a pileup. It seemed so very hard and complicated. Two months later I traveled out west and successfully activated, on my own, Yosemite National Park, Death Valley National Park and Joshua Tree National Park. In July of 2016, I did a ten-day road trip to Ohio from New Hampshire and completed eight activations. While others participating in this event have garnered more conversations, or contacts, during an activation while they’re at one of the 400+ National Park units, I thought my 113 contacts at the Flight 93 National Monument were quite impressive for a relative beginner. Never before had I ever garnered that many QSOs in a day, a week, or a month! I did all of my activations with an Elecraft KX3 and a simple 29-foot wire antenna that most times hung vertical from a tree. The simple wire was attached to a 9:1 unun. A trusty 4.5 Ah BioennoPower lithium-iron-phosphate battery provided ample power to have success at each site. My KX3 is capable of 15 watts output power, but on most activations I only used 10 watts. By the time I did my last activation, once again at Saint Gaudens in late August of 2016, I felt that chasers would descend on me at Katahdin Woods and Waters like ants on cookie crumbs at a picnic. Success breeds success, right? The NPOTA event had become so popular that thousands of operators are constantly monitoring the frequencies, spotting websites, and social media pages like the ARRL’s NPOTO Facebook page so they can make contact with activators like me who are out in the elements setting up their equipment in the historic and/or gorgeous National Park sites. Dave and I were the first people to arrive at a glorious scenic overlook just east of Mt. Katahdin that morning. 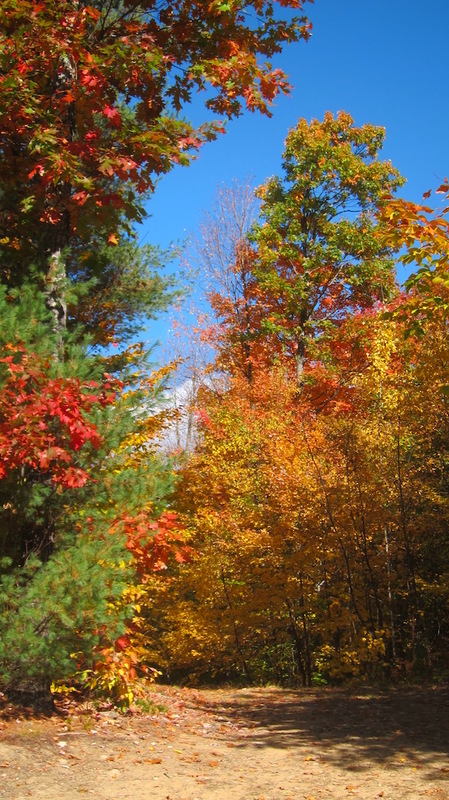 Once we turned left onto the 16-mile loop road, we had to travel about six miles to get to a stunning slope that gave you a 200-degree vista of Baxter State Park. 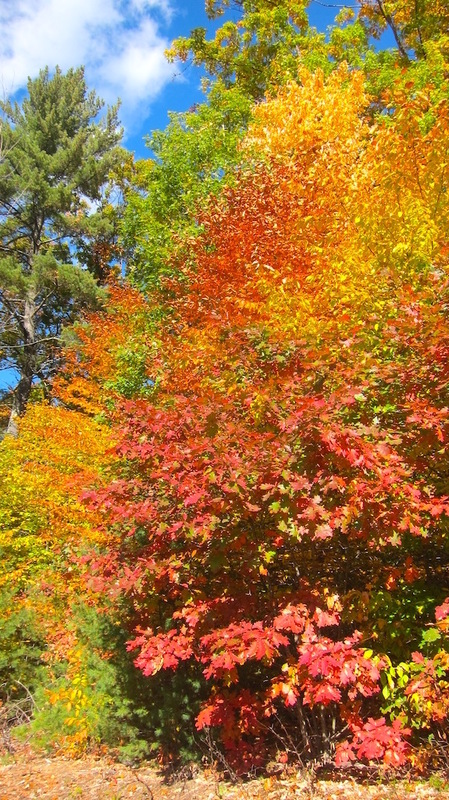 Along the way we were treated to gorgeous fall color and views of Mt. Katahdin. 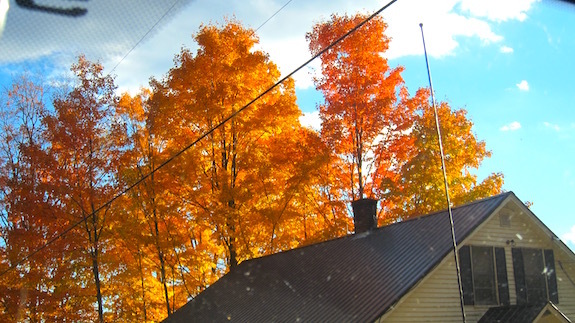 I was so overwhelmed with the beauty I neglected to notice there was an absence of tall trees. Evidently most, or all, of this new National Monument had been heavily logged, probably in the past eight or ten years before it was gifted to the park service. Mt. Katahdin was so striking it reminded me of the Grand Tetons in Wyoming that rise up from the Earth like a whale breaching in the ocean. The scenic overlook was small and very primitive. 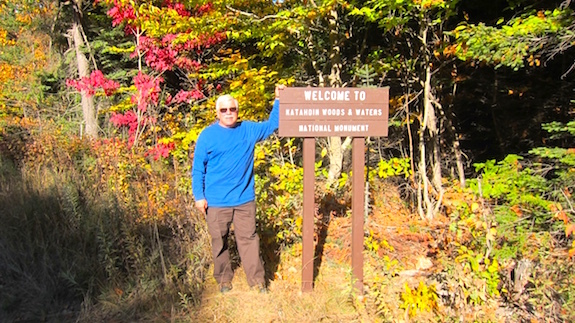 Katahdin Woods and Waters is virtually undeveloped. It’s just coarse gravel roads everywhere. There’s no visitors center. There’s no developed camping sites. There’s nothing but dust, potholes, moose and beauty. The overlook was tiny and had two standard picnic tables and parking alongside the road for maybe five cars or pickup trucks. There was a simple pit toilet structure about 200 feet from the overlook. 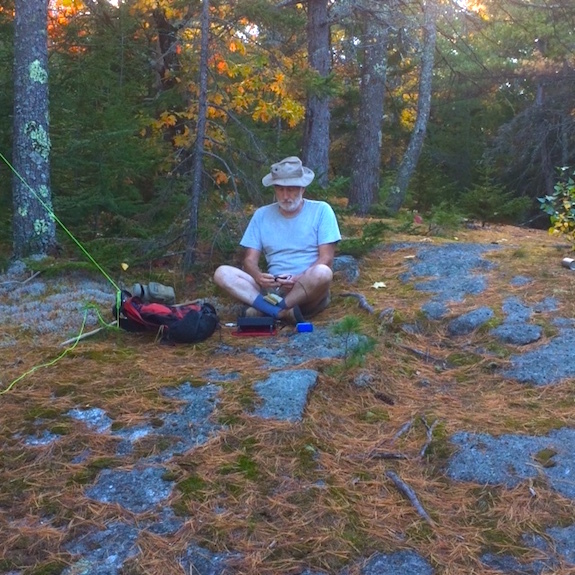 I set up about 120 feet away from Dave down a slight grade near the pit toilet because he needed a picnic table to support his wood antenna bracket. It didn’t take us long to get on the air. The only tree I could find to support my simple 29-foot wire antenna was perhaps 16 feet tall and it’s top branches were as thin as a cocktail straw. I had a bad feeling that soon ballooned into extreme frustration. Somehow we had limited and sporadic cell phone coverage. I was able to get some text messages out to Emily Saldana, KB3VVE. She’s an avid NPOTA chaser and does some activating. I was hoping to get her into my log and have her announce to the world what frequency I was transmitting on. I also tried to contact Jim Cluett, W1PID, to have him spot me. If you’re new to this great hobby, spotting is done on several websites one of them being DX Summit. An operator who hears you and makes contact with you can then tell the world via these websites who you are and what frequency you’re on. If you get spotted, the NPOTA chasers come at you faster than a shooting star blazes across the night sky. Your success as a NPOTA activator often hinges on being spotted. But it wasn’t to happen. Emily couldn’t hear me. My antenna was wretched. It was worse than wretched. My meager 15 watts was not able to get my signal out. I was able to hear other stations, but they couldn’t hear me. I tried calling out to anyone on the common frequency a low-powered station like me uses. It was 14.060 MHz. I called and called and called. Nothing. I was on my way to get skunked. After forty minutes, I started to hunt around for a strong station that might be doing the same thing. Finally I found WB9EGZ. One stinking contact. 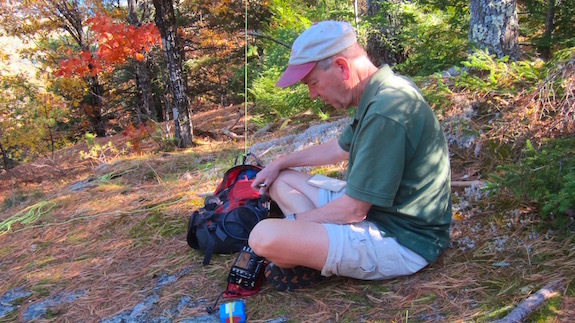 Had you bet me what might happen on this day, I was sure I’d have sixty or more QSOs in my log book in the first ninety minutes based on the pileups I had at my past activations. Because Katahdin Woods and Waters is a very rare NP unit and the weather was about to change for the worse in this remote part of Maine, I thought everyone would be trying to work Dave and I. My guess is they would if they could hear us. I discovered the source of the problem after getting home. The one wire in my 9:1 unun had snapped and was not making a connection with the center post of my coax cable. No wonder no one could hear me. The defect happened because the person who made the unun had use a wire stripper that cut partway through the wire. What’s more, the silicone caulk they used to try to secure the toroid to the inside of the plastic box had failed. The toroid was able to move around and this movement broke the connection. I should have known immediately that something was wrong with my equipment, but my lack of experience blamed something else. It would have taken less than one minute and a small phillips screwdriver to check the unun. It would have taken less than five minutes to resolder the broken wire. It would have been smart to have a tiny toolbox with me that had an assortment of tools, parts, wire, solder, soldering iron, etc. to make emergency field repairs. 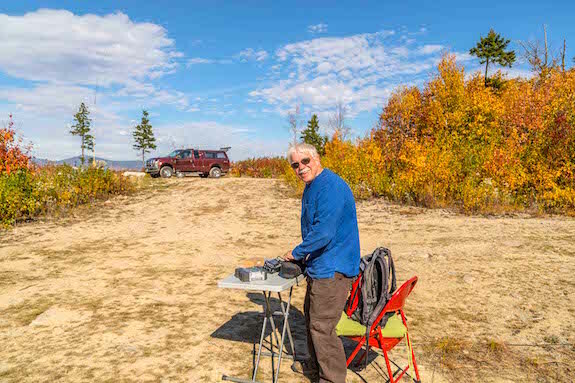 Dave is a legend in outdoor radio and QRP operation. He’s the founder of Small Wonders Lab and he invented the Rockmite QRP radio. He’s been in the hobby for decades and he’s probably forgotten more than I’ll ever know about this great pasttime. He came prepared for this outing. He knew intuitively that FAILURE was not an option after coming this far to such a remote place. This is why he brought a trusty IC-706 100-watt radio, a giant 15 Ah BioennoPower battery and a nice solar panel to force as many electrons back into the battery as possible as he sucked them out of the baby-blue battery with each transmission. 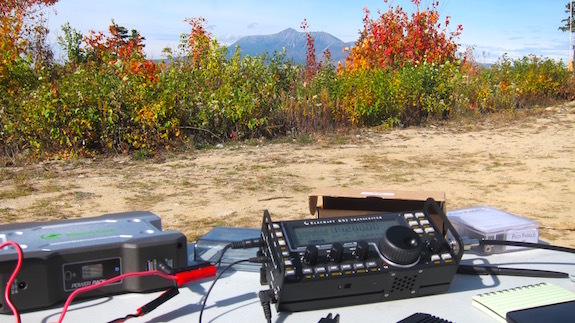 He had an Elecraft KX3 as well, but chose not to use it. Dave’s antenna was a trusty Buddypole™ that was high in the air. Dave made a special plywood holder that was clamped to the picnic table. A fiberglass extendable painters pole was in the holder and the Buddypole™ was attached to the end of the pole. All said the tip of the antenna was at least 30-35 feet in the air. Dave thought it through where we were going to be. On this stunning autumn day we found ourselves in one of the most remote parts of the USA with few north of us, others across 3,000 miles of ocean to the east, and our target chasers hundreds and thousands of miles to the south, west and southwest of us. What’s more, the sun had been cantankerous the past few months and propagation had been dismal at best. To make the trip worthwhile for himself and the chasers depending on us, Dave knew that you needed to have equipment that would perform. He knows that antennas are everything. You can pull contacts out of the ether with a tiny 1-watt radio IF you have a great antenna. This is why he brought a nice Buddyypole™ antenna. To make the antenna work as good as possible he also deployed the necessary counterpoise wires. These were stretched out upon the ground to complete his antenna setup. I *assumed* all would work out based on my past experience. I *assumed* my pixie 29-foot antenna wire would perform as it had all year. I *assumed* the 10 or 15 watts from my Elecraft KX3 would carry the day. As the morning transitioned to lunch, more and more visitors descended upon us to soak in the sun and astonishing view of Mt. 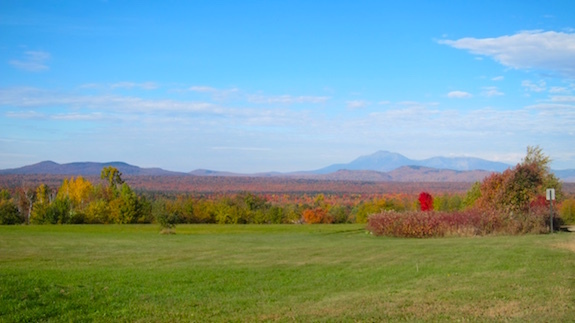 Katahdin just four miles west of us. Most were husband/wife couples who were friendly and most curious. The most common question asked of me by these tourists was, “What are you doing?” I’m a very social person and I love to get a laugh out of strangers if I can. It’s a selfish sport so my wife Kathy tells me. Because there are plenty of female operators in our great hobby, I find this to be a valid statement. I also have found it’s a great way to break the ice with strangers and get a laugh. Laughter seems to put everyone at ease. One woman smiled and said, “That’s the best pickup line I’ve heard in forty years.” She laughed out loud and smiled at me. Sadly that little bit of humor wasn’t enough to put out the raging fire of frustration I was experiencing. Dave knew I was in trouble. I was desperate. I didn’t hesitate to abandon my table and walk up to sit at his picnic table with the more powerful IC-706 and gorgeous tall antenna. We reconfigured the antenna to see what could happen on 20 meters. Within a few minutes I was working nothing but DX stations into Europe. Just about every station gave me a signal report of 20 over 9. I ended my activation working a newer friend, Carter Craige N3AO. His wife Kay was the recent past president of the ARRL. Carter sent me best wishes as we finished up the CW QSO. What a difference more power and a real antenna makes. 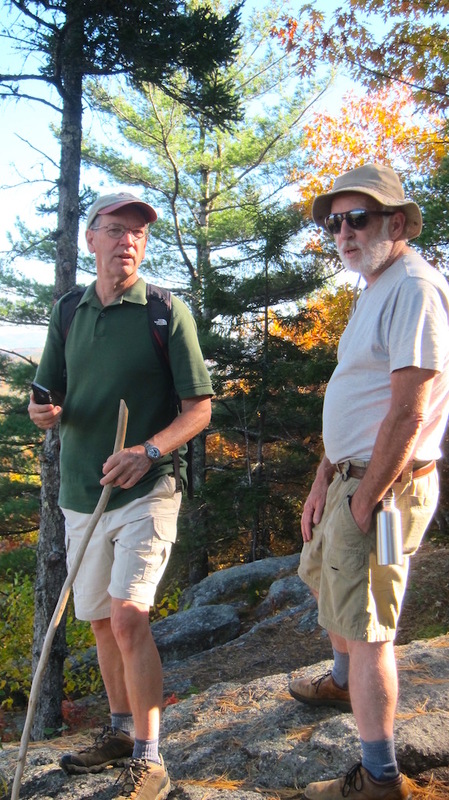 Dave shared much more about what to do and why during the trip and I’ve been blessed to have another legendary outdoor radio operator, Jim Cluett, W1PID, mentor me. I hope you’re blessed to have generous and patient mentors like Dave and Jim. Getting ready for this trip I failed to recall one of the most important things Jim taught me about outdoor radio a few years ago while we were out for outdoor radio hikes. While that may not be the exact thing he said, it’s the spirit of many a conversation we’ve had about what it takes to be a success outdoors. Looking back, it’s all about your expectations for a particular outing. 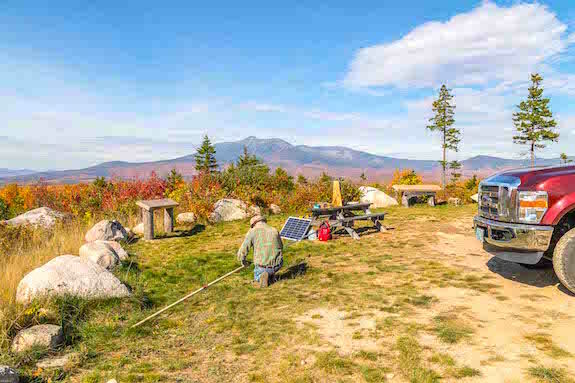 If you’re going out on a short hike by yourself and you just want to grab a contact out of the ether for your logbook, then 1, 5 or 10 watts and a wire antenna may allow you to achieve your goal. But if you have hundreds of chasers in the waning weeks of a huge event trying to put a rare NPOTA unit into their logbooks and they’re counting on you to be there for them, then perhaps you need to up your game. Perhaps you need to take tools and even inexpensive spares. It costs less than $10 to make an unun. You can bet the next time I invest three days of my time driving hundreds of miles to and from Kathadin Woods and Waters, or any other remote National Park unit, and have hundreds of chasers wanting to put me and that unit in their logbook, I’ll remember Jim’s words of wisdom. I’ll be packing plenty of power, a respectable antenna, tools, parts and whatever it takes to make contacts. Please realize that even though this tale seems serious and sort of doom and gloom, I had a magnificent time and would go back again in a heart beat. But you know what I’ll have with me!